NEW YORK, New York, March 3, 2017 (ENS) – As the sun rose on UN World Wildlife Day across the globe today, the morning opened in Kenya with a shootout between suspected poachers and a Kenya Wildlife Service anti-poaching team. Two suspects were gunned down at Kulalu Galana Ranch in Tsavo East, and a KWS officer was airlifted to hospital with non-life-threatening injuries, says KWS spokesman Paul Udoto. A weapon and ammunition were recovered, and a hunt for the rest of the suspects is underway. 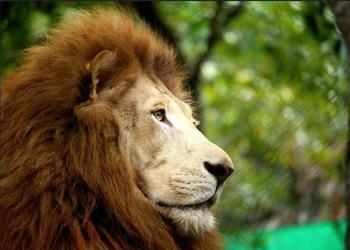 The world has lost 50 percent of its wildlife in just 40 years, according to the United Nations. The most grave and immediate threat is from poaching and illicit trafficking in wildlife and wildlife products, with transnational organized criminals now targeting high-value species. Wildlife crime is worth many billions of dollars every year, as serious a crime as illicit trafficking in arms, drugs and humans. In New York, the President of the General Assembly is hosting a high-level discussion on illicit trafficking in endangered wildlife, and the role of youth in wildlife conservation, the theme of this year’s UN World Wildlife Day. “Strict enforcement of laws is important, but so too is awareness,” Guterres added, appealing to young people to protect their inheritance by becoming informed and acting to protect wild animals and plants from the threat of extinction. “We must listen to them and nurture their engagement, to craft new forms of action to conserve and protect wildlife on the basis of solidarity,” she said. To see videos and listen to some of the young voices, go to #YoungVoices and #Youth4Wildlife. Extraordinary images of wildlife are online from the 10 finalists of the World Wildlife Day Youth Photo Competition. “The 3rd of March is the opportunity for all of us – no matter who we are or where we are – to celebrate the beauty and variety of the millions of plants and animals that we share our planet with, both terrestrial and aquatic,” said Scanlon. “Given the current rate of poaching and smuggling, will future generations one day speak of elephants, rhinoceros and many other endangered species as we speak of mammoths? We must not and will not allow this to happen,” said Scanlon. 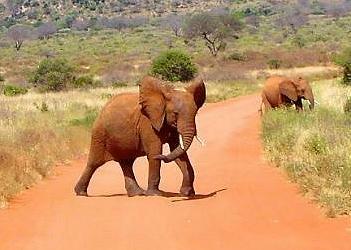 “Our generation has not yet succeeded in securing the future of many wild animals and plants. Meeting this challenge will now be shared with the next generation,” he said. “The good news is that there is a global collective effort underway to tackle illegal trade in wildlife and at the global level all of the necessary elements have fallen into place to effectively combat these highly destructive crimes,” Scanlon said. Authorities now have support to apply the same tools and techniques used to combat other serious crimes – modern forensics, enhanced investigation techniques, and tackling money laundering. INTERPOL, the international police force with 190 member countries, reports that Operation Thunderbird, focused on the illegal trade in wildlife and timber has resulted in the identification of nearly 900 suspects and 1,300 seizures of illicit products worth an estimated US$5.1 million. Codenamed Thunderbird, the three-week operation, conducted between January 30 and February 19 involved police, customs, border agencies, environment, wildlife and forestry officials from 43 countries and territories. The operation’s 370 investigations have already led to 89 individuals being jailed with terms ranging from several days to seven years. Among the more than 14.3 tonnes of marine wildlife seized were 180 dead seahorses concealed in snack boxes discovered by U.S. authorities, with additional seahorse seizures also made in Mozambique. In Hong Kong, China, officers seized 1.3 tonnes of red sandalwood hidden in a container shipped from Malaysia. Intelligence gathered and shared ahead of the operation identified specific targets and areas for action such as wildlife and forest crime hotspots, bottlenecks where checkpoints could be established, as well as operations at airports and national borders. Cars, trucks, boats and cargo transporters suspected of moving illicit products were also targeted with searches carried out by officers, specialist sniffer dogs and x-ray scanners. Scrap yards, taxidermy shops, garages, pet fairs, warehouses and health clinics were targeted, resulting in seizures, arrests and information gathering. 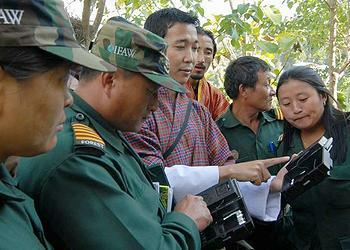 Websites and social media offering wildlife products were investigated. “Wildlife trafficking has surged in recent years, generating billions in illicit profits. 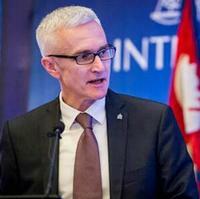 Simply put, criminals are helping themselves to the environment’s precious resources without a care for the cost to our planet,” said INTERPOL Secretary General Jürgen Stock. Operation Thunderbird was organized at meetings held alongside the 17th meeting of the Conference of the Parties to CITES (CoP17) held in Johannesburg, South Africa last September. Operation Thunderbird partners are: CITES, WCO, the UN Office on Drugs and Crime, the World Bank, the INTERPOL Wildlife Crime Working Group, the U.S. Fish and Wildlife Service, the UK Border Force. and Environment Canada. The intelligence and data collected from the operation will be compiled, analyzed and used as guidance in future national, regional and international enforcement efforts. 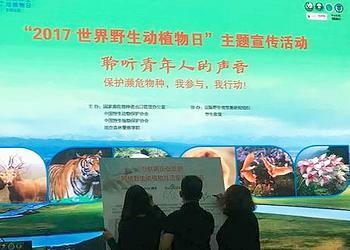 In Nanjing, China, World Wildlife Day was marked by a public pledge from Baidu, Alibaba and Tencent – the top three internet service providers in China – to create an industry-wide alliance to tackle illegal wildlife trade online. The Baidu, Alibaba and Tencent “BAT” pledge was made during a “Listen to the Young Voices” event, where young people from government, associations, relevant private sector organizations and NGOs expressed their passion for protecting wildlife. Among them, the three BAT internet giants have hundreds of millions of global users and a major influence on daily life and consumption patterns in China through their social media, online trade and search engine services. TRAFFIC’s regular online market monitoring in China reveals an ongoing shift of illicit trade in wildlife products from physical markets to online platforms and onto social media, as a result of increasing law enforcement efforts. – Pandas are no longer classified as Endangered by the International Union for the Conservation of Nature. In September, the IUCN announced that the giant panda would be downgraded from endangered to vulnerable as a result of a recent 17 percent increase in population numbers. – Saving World Heritage sites: Belize’s barrier reef saved from offshore oil exploration; Spain canceled plans to dredge Doñana National Park. – China announced closure of the world’s largest legal ivory trade market by the end of 2017. Last year it was revealed that there could be a 67 per cent decline by 2020 in global populations of fish, birds, mammals, amphibians and reptiles and that there already had been a 58 percent decline between 1970 and 2012. The Living Planet Report 2016 issued by WWF and the Zoological Society of London shows that humans are pushing species populations to the edge as people overpower the planet for the first time in Earth’s history. A joint INTERPOL – UN Environment report published in June 2016 estimated the value of all forms of environmental crime – the illegal trade in wildlife, corporate crime in the forestry sector, the illegal exploitation and sale of gold and other minerals, illegal fisheries, the trafficking of hazardous waste and carbon credit fraud – as worth between US$91-258 billion. These figures are expected to increase, with current estimates showing environmental crime growing at a rate of five to seven percent annually.